In 1990 Nintendo hosted a national video game competition to crown the "Nintendo World Champion". The event traveled to 30 different cities nationwide and held a final event in Universal Studios California. This package includes memorabilia from this event. All of these items together are worth $2,000 and are extremely hard to find by themselves. As a package they're even more rare. Nintendo World Championships T-Shirt - A yellow t-shirt with the official NWC logo on the front. This shirt was given to champions in each of the 30 cities and for each age of the three age groups. There are only 90 of these ever made. NWC Champion Plaque - A black plaque that was given to each champion. Only 90 of these were made and each one is unique. 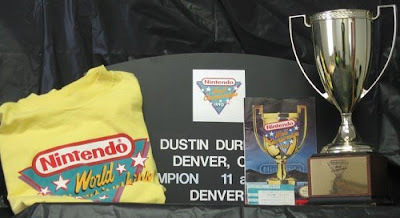 The plaque given away in this bundle was won by Dustin Durham in the 11 and under category at the Denver, CO event. Champions Gold Trophy - A trophy given to the winner of each age group in each city. The trophy was also won by Dustin Durham. Nintendo World Championships Insider Guide - A magazine created for the Championships. The magazine has advertisements for companies who had games on display at the competition. It also gives details about the event structure and what people can see while they aren't competing. Nintendo World Championships Ticket Stub - A ticket stub for the Oakland, CA NWC event.